Extract-Transform-Load - Octavo Gate Ltd.
A suite of applications which run along side your legacy systems building continually up to date Data Marts to feed into your Data Warehouse. Extracts data from legacy database to a local file repository. Extracts all or parts of tables either as scripts or as separated files. Can generate create scripts, similar to mysqldump. Monitors files and folders and determines how to share their contents. Can share via emails as links to the source files or as attachments. Can share via FTP/sFTP upload for remote sources. Can share via file copy onto mapped network drive or UNC source. Supports file and folder compression. Loads the output from the ETL Extract program into the destination database. Looks for the existence of specific files in specific folders either scripts or separated files. Where scripts exists it optionally drops/creates the destination tables as necessary. 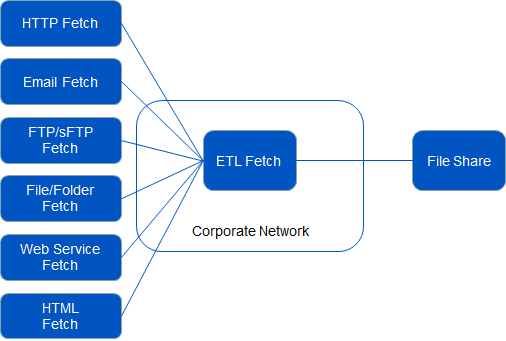 Process to fetch files from external sources. Can retrieve files from HTTP/HTTPs servers, link is parsed and the file downloaded automatically onto a local folder. Can pull files from emails either as files to UNC, links to FTP, links to HTTP and as attachments, all downloaded onto a local folder. Loads structured files into a staging database, effectively converting a file into a database table. Dimensions tables represent data which provides context to the facts being collected, an example would be a date, a time, a product and employee etc. Automates the production of dashboards by prefetching into a database cache to improve performance in the user experience. Can generate static HTML reports into a file server cache, to speed up generation of common reports using HTML 5 templates.